Home » How Well Do Bank Analysts Really Perform? “Analysts are not traders, they are publishers. They are forced to perform on a daily basis and release information regardless of market conditions. As a result, many are oftentimes found guilty of common pitfalls that traders interpret and subsequently trade. An analyst at Deutsche Bank / some guy on a forum / a retail broker’s 20-something year old analyst with a $30,000/year salary isn’t trading your account. In a recent presentation I showed the following image….and it's one of my favorites. It's the Reuter's Forecast Poll of major banks for EUR/USD over the actual currency price. Power of authority, or whatever you want to call it, is unquestionably one of the biggest hurdles that battle traders, particularly when they are starting off. I posted an article a while back entitled Death By Opinion. That post outlined the theory. This, essentially, is the proof. P.S. If you're ever going to use any kind of moving average crossover system, use this one. It seems pretty reliable. What exactly is the yellow line and is it available outside of Reuters (I assume that’s where this graph was generated)? 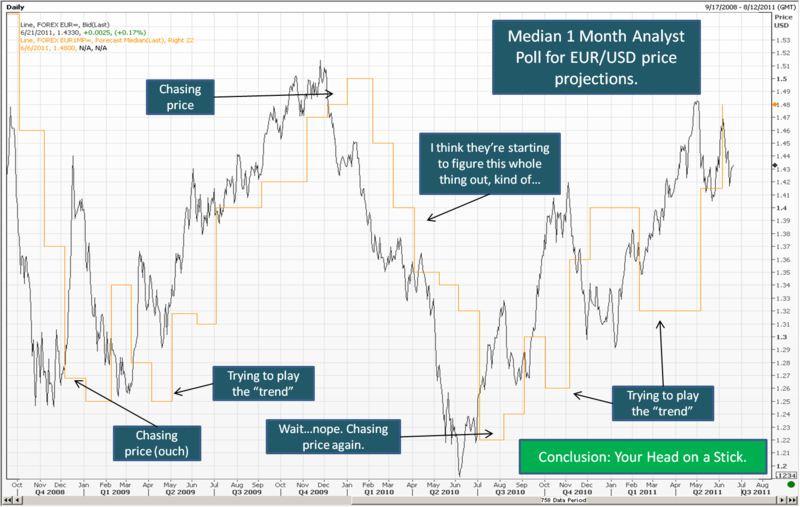 The yellow line is the consensus poll (price thought to be where EURUSD would end up), just translated on the graph. Outside of Reuters, not too sure where one would find it. Hi Steve, I am at work reading your blog and boy am hooked. There’s so much to go over and so little time. I really appreciate the time and you’ve put in and I want to say a BIG THANK YOU. I do have a question to ask tho…I really like moving averages and use them often in my testing and trading…I would like to know your tots on moving averages and if there’s any insights you can share with me on this tool. Hi Ejeh, Thanks for the great word/comment. In regards to moving averages, in all seriousness I just simply do not use them. About the only thing I “dress” my charts with are pure support and resistance, horizontal and diagonal. You’ll also notice from a recent post I have a simple cycle system I toy with in my spare time, but that’s really about it. Thanks again.